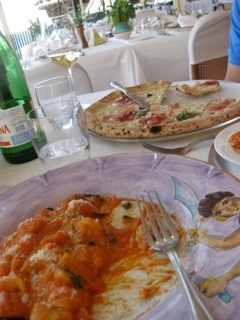 My husband and I took off the day after our wedding September 13, 2008 for Italy [Rome, Positano, and Capri]. We were gone for two weeks and enjoyed every second of it. We were engaged for over a year and had a large wedding, which was so much fun, but we were ready to escape everything and explore Italy. When we were planning our honeymoon, we knew we wanted to go somewhere new, somewhere with a direct flight, and a place we could relax. We are both very interested and enjoy (too much) food and wine, so Italy was the perfect choice. We knew that staying in one city would get boring for us since we are not huge on tourist attractions, so we chose Rome (5 days), the postcard city of Positano on the Amalfi Coast (4 days), and the island of Capri (5 days). Being by the ocean was a huge part of why we chose the second two cities, since we love a great view and boating. 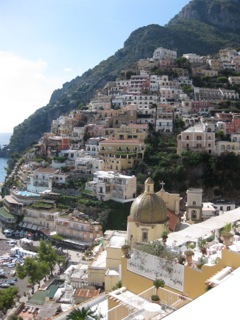 This was the view from their hotel room in Positano. Not too shabby, huh? It is hard to put my finger on the best part of our honeymoon, as every day was incredible, even if we hardly left the balcony of our suite. Funny enough, Matt and I always look back fondly on the afternoon we got to Positano and the rain. It rained our entire wedding day, so it was only fitting we saw a bit of it on our trip. We checked into our cliffside hotel and went out on the balcony to soak in the ridiculous view of a city we had only seen in photographs. It started to rain and we laid down on the lounge chairs outside and fell asleep to the gentle rain that began to fall. When we woke up, we walked down during the sunset to The Brasserie at Hotel Covo dei Saraceni for the best pizza we had on our entire trip (we sampled it everywhere, seriously). It was the the perfect (unplanned) day, which we enjoyed many of instead of being too touristy. If I could change one thing it would have been to do more research on restaurants. We relied heavily on the concierge of each hotel and it would have been more fun to go to places recommended by friends or travel writers I love. Luckily, we did not have a bad meal anywhere. How could you in Italy? Once we picked the destination, Matt took the reigns and booked everything. It was such a fun surprise seeing what he chose when we arrived in each city. It also let me focus on the wedding and look forward to a wonderful getaway. The biggest splurges on the trip were by far the suites we stayed in, specifically in Capri. We had an incredible view, multiple rooms, two scenic balconies, a giant tub with a view of the mediterrean, and daily room service. It was excessive, but worth it. Traveling together to a new place is something we look forward to every year. With kids in the picture, that has been put a bit on hold, but we love plotting out our next big getaways. Ireland and Prague are high on the list, as well as a big trip to Asia to visit Thailand. Tips for Rome: Pick one big destination a day and spend the rest of your time in Trattorias and exploring the cobblestone streets. 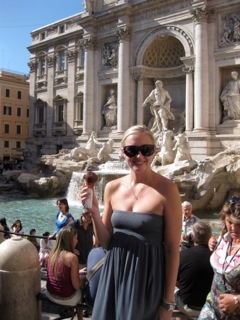 The Vatican and Trevi Fountain are not to be missed. Tips for Positano: If you are staying for multiple days, this is really a place to just relax by the beach, walk the steep streets, and enjoy the local cuisine. Tips for Capri: If you stay in Anacapri, it is quieter than downtown and has better views of the ocean. Mind that taxi rides are incredibly expensive to town, so be prepared. Charter a boat with a captain to give you a tour of the island from the water, with a stop at the Blue Grotto.